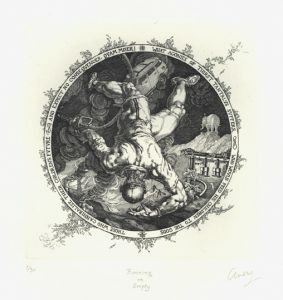 As promised, a new etching based on the engraving Tantalus from the 16th century by Hendrick Goltzius has been completed this summer, and is titled Running on Empty. This is the third in a series of four, and who knows when the fourth will be done, as I adamantly refuse to entertain the possibility of ever doing another one of these again each time a new one is completed. As you will remember (! 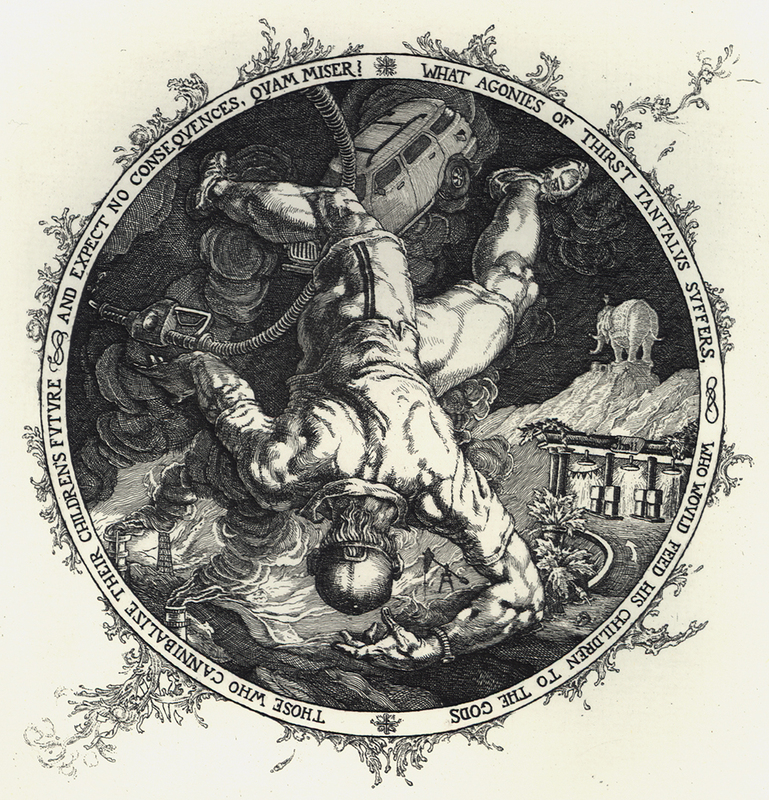 ), Tantalus, a mortal fathered by Zeus, had, among his other indiscretions towards the gods, decided to kill, dismember, and boil is son Pelops, and serve him at a banquet for the inhabitants of Mt. Olympus, to test whether they were actually omniscient. It was a mistake. They were. His punishment was to be made to stand in a pool of water that receded every time he tried to satisfy his thirst, and to stand under a tree that pulled away its branches whenever he tried to pluck any fruit. (In ancient Greece, cannibalism and the killing of kin were considered to be among the worst atrocities one could commit). Of course, I have replaced the fruit tree with a gas pump nozzle (see lower right). Does the denial of science in the name of commerce render the balance of nature oblivious to the cannibalization of our children’s future? 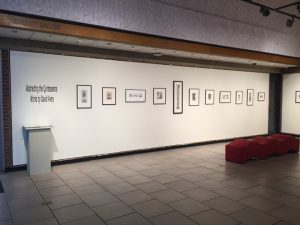 This spring I had a very successful exhibition at the Sarratt Gallery at Vanderbilt University in Nashville, and will once again be participating in San Francisco Open Studios at John Gruenwald Press, which will take place on the second weekend, October 22nd and 23rd. Stay tuned for more information.